I have heard a lot of good things about Titan. They’re one of the largest watch manufacturers in the words (5th largest to be exact) and ranked among the top 100 luxury watch companies. Brought and distributed in Malaysia by Chronosoft Sdn Bhd, I’ve seen their timepieces around and when I heard about the launch of their Moonlight collection, I dropped by Svago in KLCC to check it out. The Moonlight collection by Titan is inspired by the beauty of objects captured in moonlight. Mr Vijesh Rajan (Business Head International Division, Titan Company Limited) was there to share the stories behind the creation of each of the watches. I was particularly impressed by this one. It’s inspired by the Taj Mahal and features Swarovski crystals. This is called The Taj and is described as “a stunning illustration of the iconic monument, these timepieces draw inspiration from the awe-inspiring silhouette of the Taj Mahal on a full moon night”. Mystic Luna is inspired by the moon goddess Luna and I like the beauty and elegance of the design. Titan only uses Swarovski crystals exclusively in their Moonlight collection. The range is priced between RM 375 to RM 1,985 and there were models there to showcase the timepieces. The Moonlight collection is under Titan Raga, which is a range of exquisite watches for the modern women. This leans towards the more mature and luxurious target market and often features precious stones and gems embedded into the timepieces. I also managed to examine their Edge range, which is the slimmest quartz watch in the world. You can see just how thin each one is. Amazing. I also got a limited edition Titan watch! Titan creates a range of limited edition watches for the Penang Bridge International Marathon each year and this one retails for RM 525. They’re also one of the sponsors of the event and the official watch for the Allianz Penang Bridge International Marathon. This particular watch has a large face with 100 meter water resistance. It has the Penang Bridge International Marathon emblem engraved into the back of the watch. I like how there is a LCD display with digital timekeeping in addition to the regular chronograph and the day of the week is displayed as well. The leather strap offers a practical functionality and I personally prefer leather straps for versatility but you can swap it out if you want. Titan has a range of watches for both men and women and if you’re keen to hear more about it, drop by their website at Titan World or interact with them on the Titan Facebook page. My dad is a firm believer in the rule of law. He doesn’t go against the system, not even for “victimless crimes”. 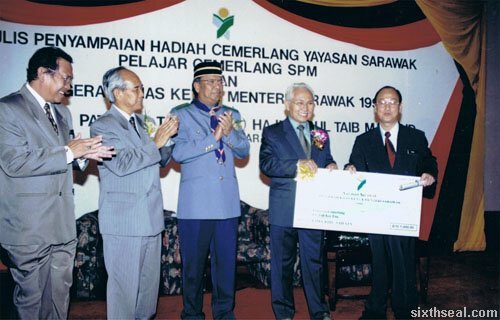 Let me give some context to this anecdote – this was almost 30 years ago, when we were living in Kuching. I knew the time and place coz the Royal London Circus had come to town and I was very keen to go and see it. 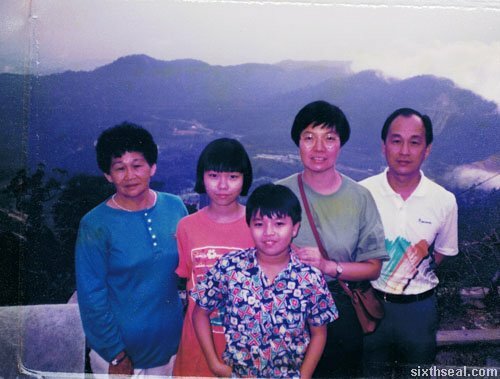 We were living in Kuching at the time since my dad was posted there as a Nazir (translates loosely to Inspector). He was on a School Inspector salary so we didn’t have much, but we made do. What my dad did back then was to go to schools and inspect the implementation of the syllabus and the state of educational institutions. If you’ve been to high school in Malaysia, you’ve probably seen someone like him – he was the guy that sat silently behind in classes to watch what the teachers teach and how the students interact. That’s not how he got his strong ethics though, that has always been there. He always told us to put our seat belts on, at a time when no one did (early 80’s). Since the circus was in town, the roads were jammed due to everyone illegally double parking. It was a long walk to the circus and we were going to be late and I was badgering my dad to just park and go. He wouldn’t have any of it. With my late mom’s urging, he nearly caved in but he didn’t. Instead, he drove to a Shell station, which was really far away and nicely asked the attendant if he could park there. The attendant didn’t have the authority to say yes or no, so calls were made (this was before cell phones) and we waited almost 30 minutes before someone called back to say we could. It was only then that we left the car in the Shell station and walked 30 miles (it could have just been 1 kilometer, but still, it seemed far back then) to the circus. My dad had been working all day and was tired and I could appreciate how hard it is to keep up with a young kid like me (I understand this better since I have kids of my own right now). I am all the more appreciative now that he didn’t go the easy way and was patient enough to wait till the proper authorizations were done before taking two hyperactive kids to the circus. I was grateful that they allowed us to park at the station premises after the circumstances were explained. That incident made a long lasting impression of the good people at Shell. 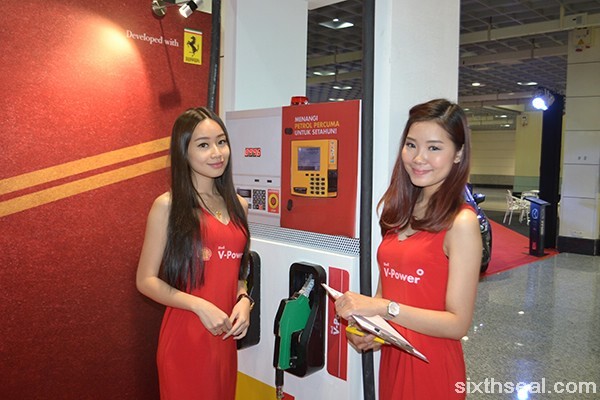 Fast-forward to today, I always make it a point to go to Shell for my petrol needs. Not only because of the good impression that I have of the company, but because of their superior service. The attendants are very attentive to all their customers, and I can always rely on them to fill up my tank dutifully while I grab some snacks from the Select Store. To up the game – my fuel tank was once filled by the station manager – and she didn’t mind it a bit, even though she could have just asked the service attendant to do the job. This is customer-orientated service. No matter what position they hold, they are dedicated to making sure that customers are well-taken care of. Shell was the first company to extract oil and gas in Malaysia. The site of the first well producing oil is still here (although it’s no longer functional). 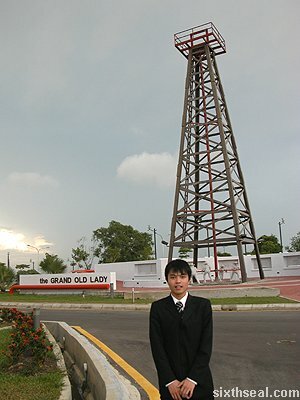 It’s called the Grand Old Lady and it’s located in Miri, not too far from where I was born in Sibu. Shell in Malaysia employs a significant number of people and contributes not just to the economy, but also towards road safety awareness, scholarships for Malaysians, and quality-of-life corporate social responsibility initiatives like the “We Care, We Share” community care programs. I’m back in Sibu for the weekend to attend my cousin’s wedding reception. Yih Wen is one of my closest cousins on my dad’s side. I used to hang out with her while waiting to go to school at my grandma’s place when I was younger. She just got married and we had the wedding dinner at Tanahmas Hotel in Sibu. I’ve actually met Kian Mun (the groom) during my previous trip back to Sibu. 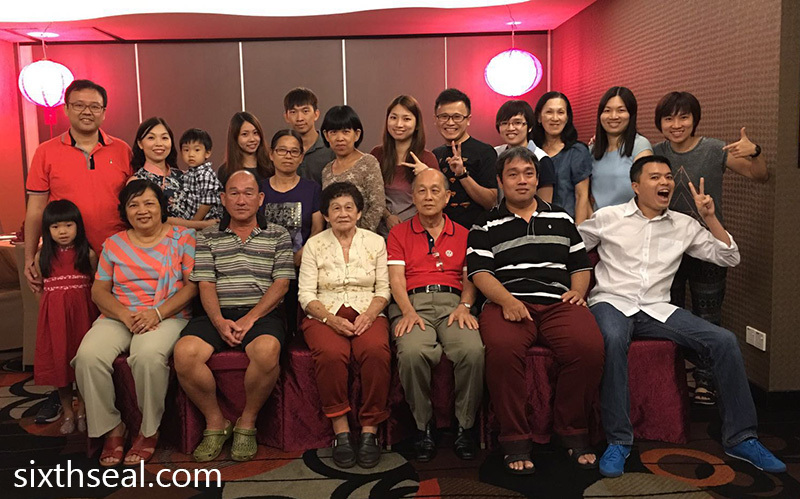 We went out for dinner together with Yih Wen’s family, a pre-wedding get-together so to speak. I find him to be a nice guy, his family is from Ipoh. Here’s my grandma! She’s the matriarch of the family, pictured here with me and my dad. 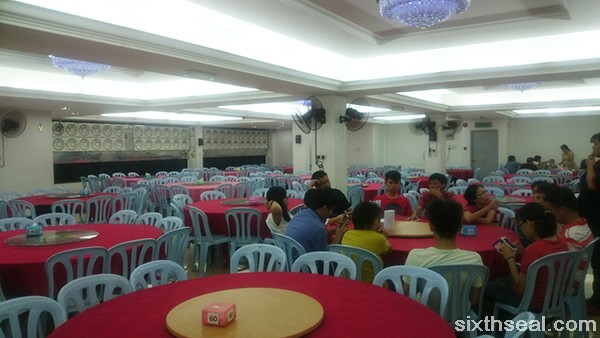 The wedding dinner was held last night on the 19th of December. I was seated with my cousin Calvin and Noble. This is the wedding cake. I was pleasantly surprised to see that it had the proper marzipan covering instead of the usual icing. I believe this is the first time I’ve seen this in Sibu. It tasted good too. This is the first course. It has six (6) items instead of the usual four. I rather enjoyed the prawn cocktail in the middle. I have a weakness for sweet mayo covered shrimp. The pickled jellyfish was nice too. 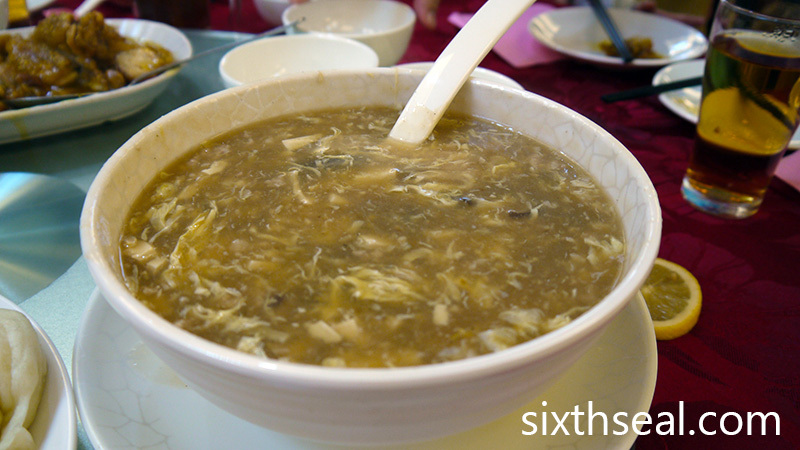 A traditional soup course that’s eaten with vinegar. The server didn’t pour the vinegar into the soup though (coz not everyone likes it) so we helped ourselves. I believe the fish was battered and deep fried first before being put into a salamander and grilled to melt the cheese. This is my favorite dish of the night – I find that I like fish more and more as I get older. This wasn’t the case in the past, actually I don’t think I’ve eaten fish willingly before my mid-20’s (except for stuff like smoked salmon). The fish goes well with the cheese, the latter imparts a pleasant umami component. The right side is a classic Chinese roast duck and the left side is a braised duck. I thought the duck should have been rendered a bit more but the plum sauce was good. 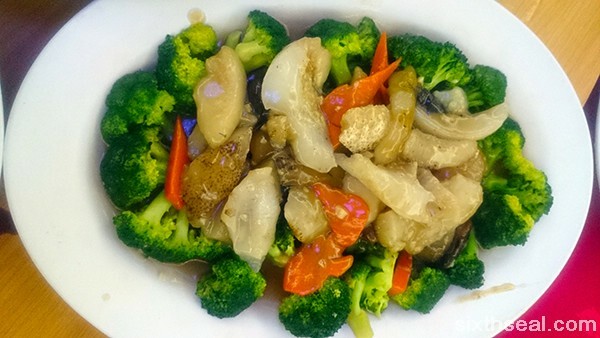 This medley contains sea cucumber, Pacific clams and razor clams arranged over fu chuk (tofu skin) and broccoli bordering the side. 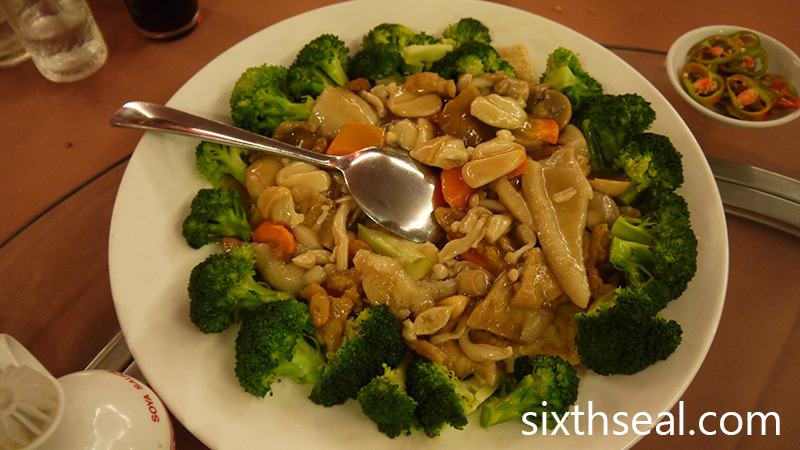 It’s another established dish in the Chinese wedding dinner repertoire. I’m quite fond of stuff like this – anything from the sea would catch my fancy nowadays. This is a huge prawn but unfortunately I was quite full at this point so I only had one. I was very impressed with the size of the jumbo shrimp. I thought this was a very clever implementation – both the desserts are made using red beans but one of them is deep fried into thin pancakes and the other has a mung bean filling and is stuffed into a mochi-type casing. 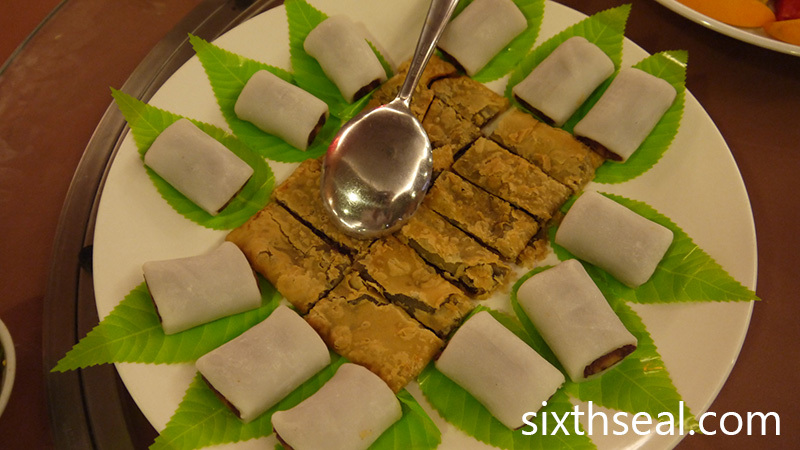 The former is a traditional Chinese festive dessert. Oh, how I’ve missed eating plum powder! Haha. This is the stuff we used to get with sliced guava and it always seemed to be in short supply when I was a kid. 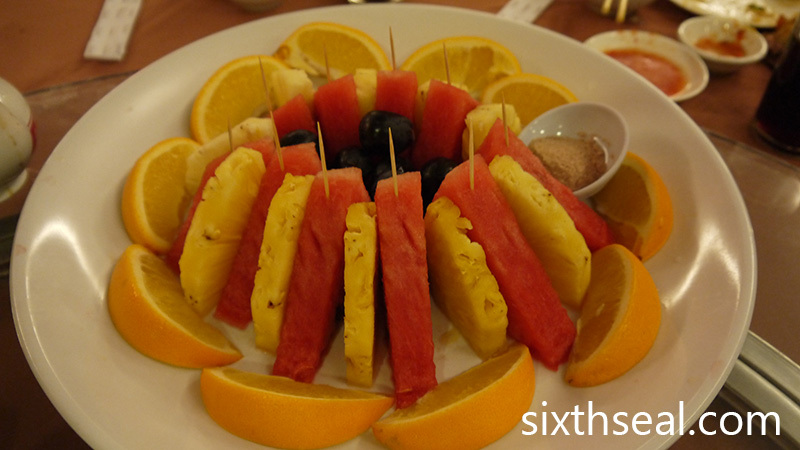 It’s very more-ish and goes very well with all sorts of fruits. 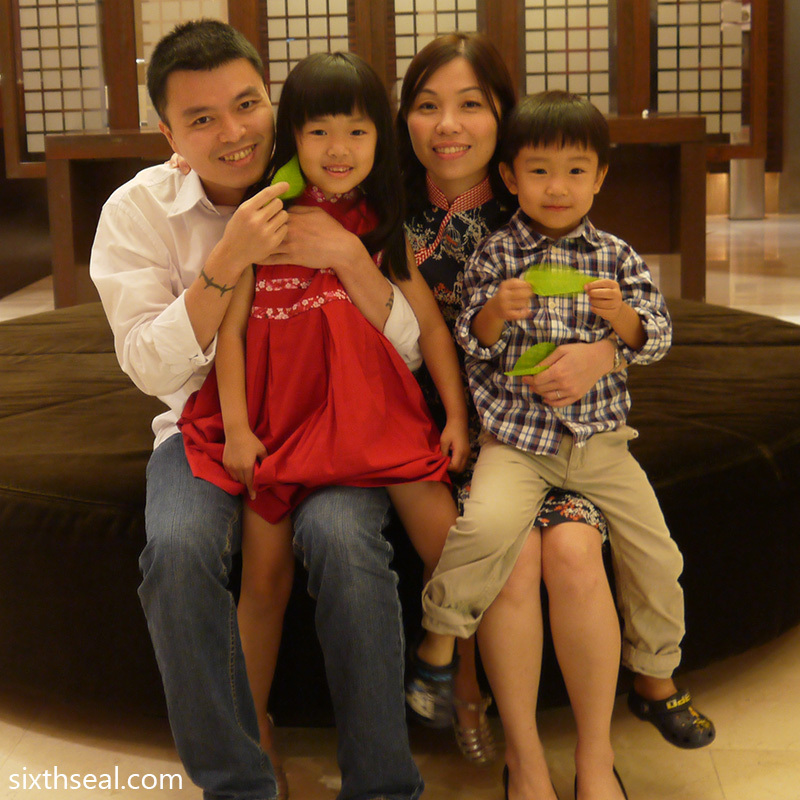 Yih Wen and Kian Mun had their wedding vows done yesterday morning. I was there to help set off the firecrackers. Haha. These are the large 39,999 Chinese firecrackers roll. 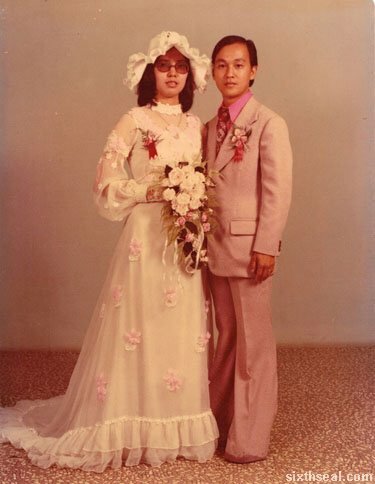 I went with my dad early in the morning and took a photo with the bride. Yih Wen is my cousin, my uncle’s daughter. I had the traditional mee sua (longevity noodles) with chicken soup. I was told to light it up just before the groom’s delegation came. These are all my cousins. They are the gatekeepers keeping the groom out until ang pows (red packets) has been distributed and questions answered in a satisfactory manner. …and the groom went down on bended knee to present the bride with flowers. The bride and groom then attempted to kiss for a full minute. The customary tea service was done by Noble. The bride and groom basically bow three times to people in their lives (these are the parents of the bride) while serving them tea. My dad, being the brother of the father is pictured here. …and the bride left for the groom’s place. 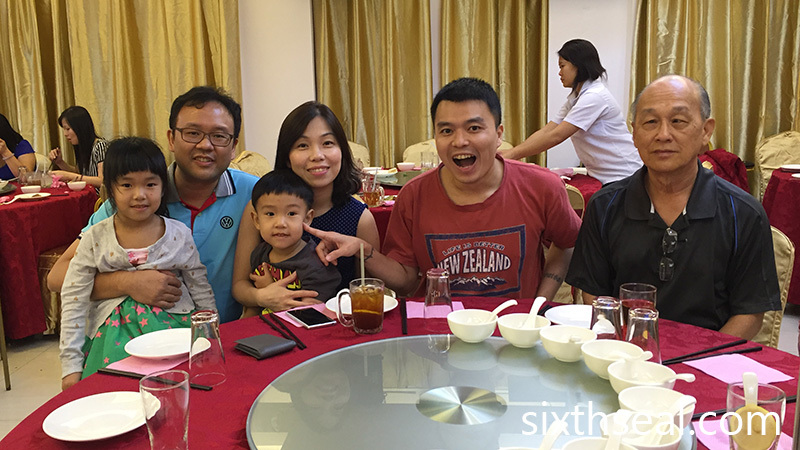 Since the groom is from Ipoh, there’s no house to go to – they went to his hotel room instead. It’s a symbolic gesture to mean the daughter has officially left the care of the parents. 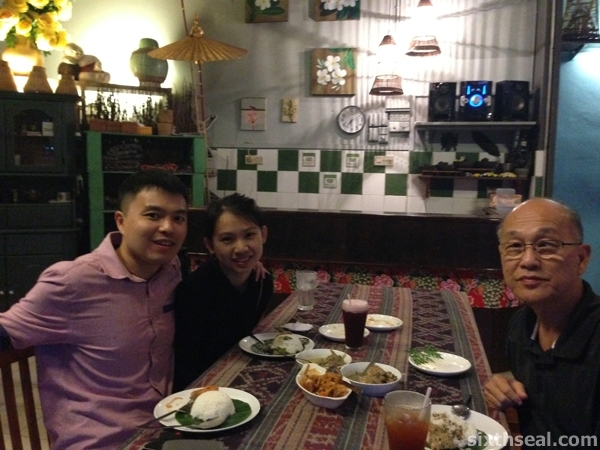 I asked my dad where he wanted to go for dinner on Father’s Day – Payung Café, Ruby Restaurant or some other place that he liked (perhaps one of the new cafes out there). He said he’s more used to eating Chinese food and opted for Ming Mei Shi. 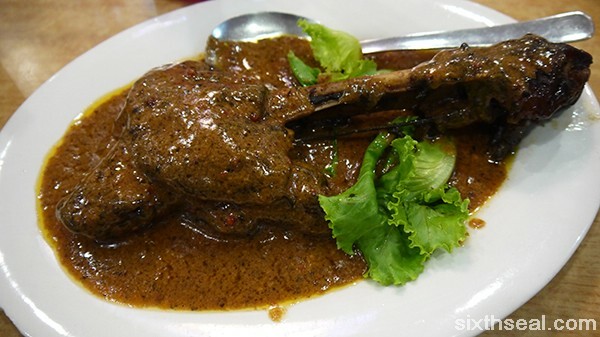 This is cooked rendang style (which originated from Minangkabau in Indonesia). 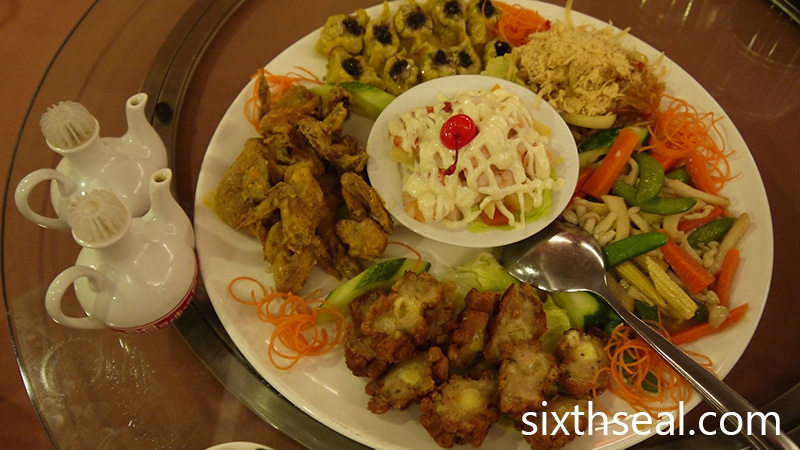 It was recommended as one of their flagship dishes when we asked for something different. I don’t eat lamb much when I’m with my better half since she doesn’t like it but my dad does. 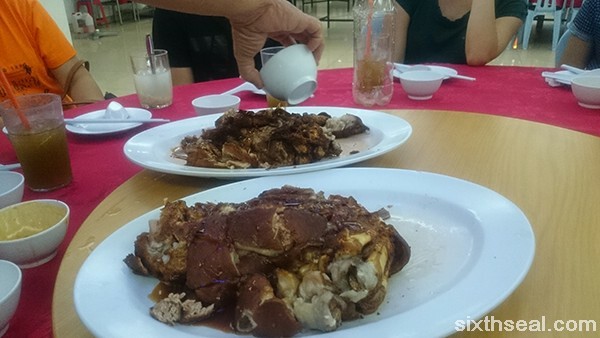 Granted, it’s been made to suit local Chinese palates but it tasted magnificent! The strong cinnamon and aniseed gravy goes perfectly with the rice and the lamb is fork-tender. 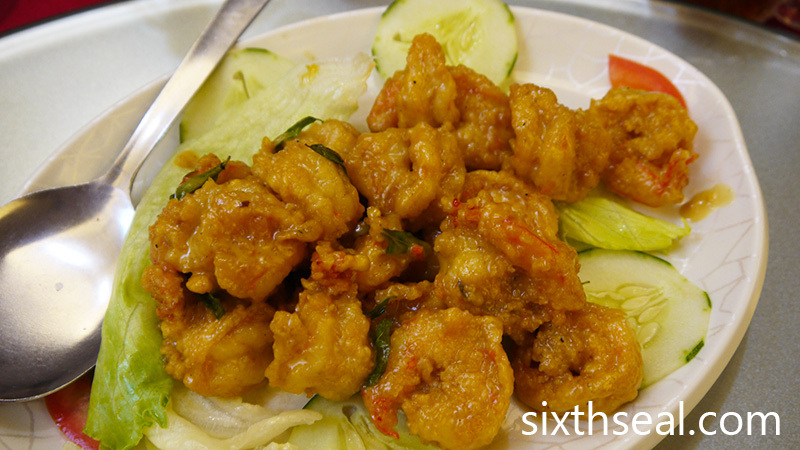 We usually go for butterscotch prawns but wanted something different so we switched to the drier butter fried prawns. 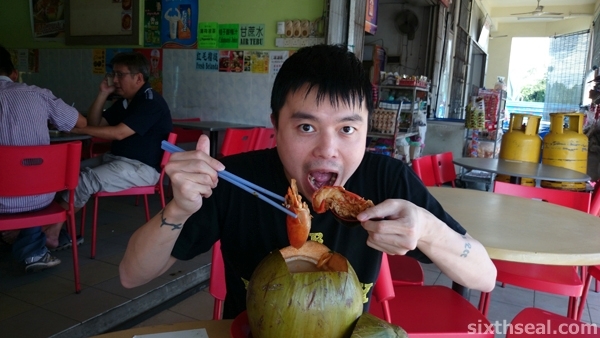 Ming Mei Shi also has big head prawns for RM 50 per prawn which I was personally interested but my dad vetoed the idea since he doesn’t really like that type of prawn (don’t know if it’s coz of the price but I know he doesn’t eat crustaceans much). This doesn’t have the nice gravy but we have 3 other wet dishes so we thought it’ll make for an agreeable change. It was delightful! 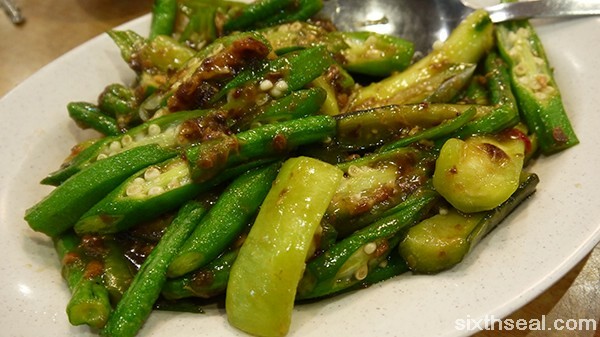 This is a classic Chinese restaurant dish that consists of 4 different types of “beans”. The quotation marks are there coz brinjal (eggplant) is not actually a type of bean. They usually use the purple type but there’s also a green variety. 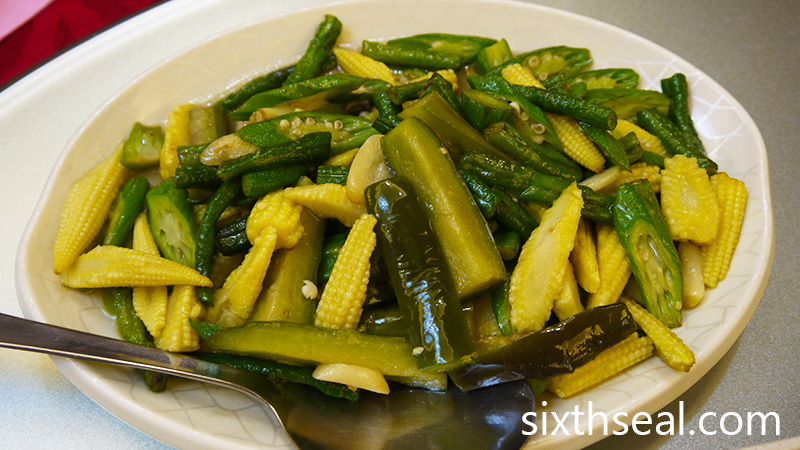 The four vegetables are ladyfingers (okra), squash, brinjal and long beans. 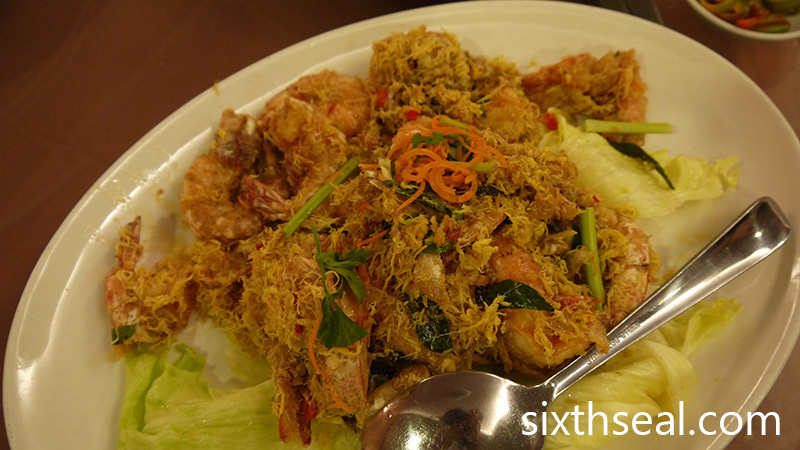 It’s topped with pork mince and taucu (fermented soya beans) and it’s very good. 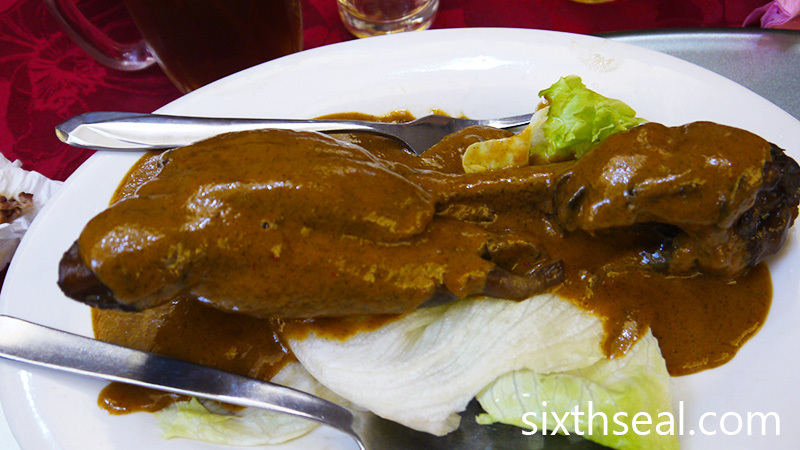 This is another one of their signature dishes. 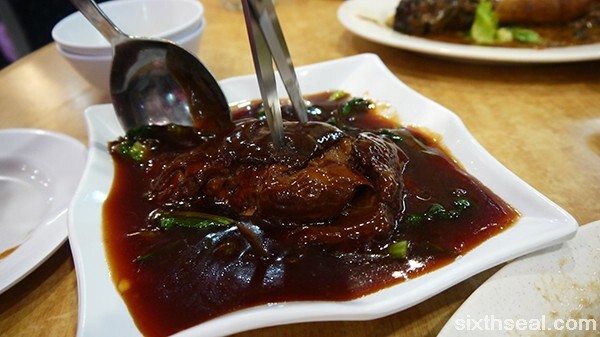 Dongpo pork is braised before being slowly stewed with Chinese wine. 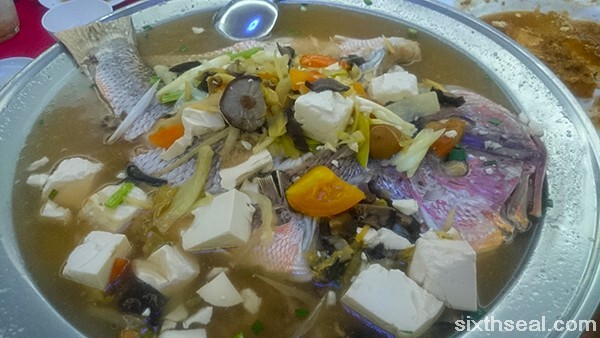 It comes in a huge square chunk tied with cooking twine, which is then snipped off by the waitress before the meat is cut into manageable bite-sized portions with a pair of kitchen scissors. 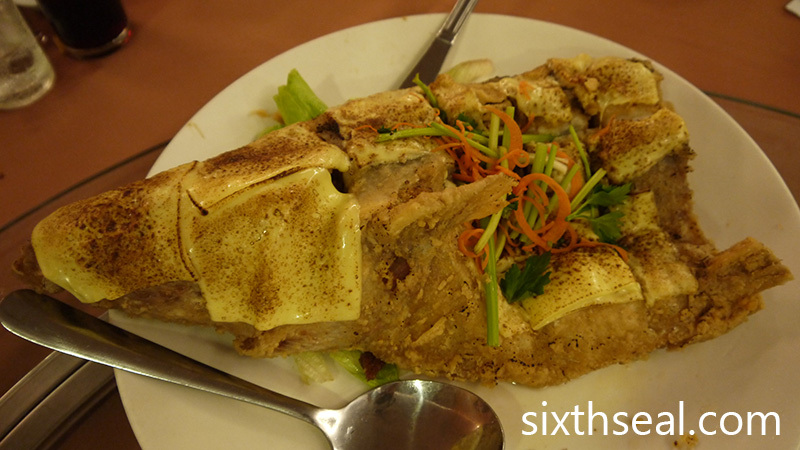 Interesting fact: I was using Pleco (the Chinese-English app) to research why this dish is called such. My dad thought it was dong as in east but it turns out that it’s named after the poet Su Shi a.k.a. 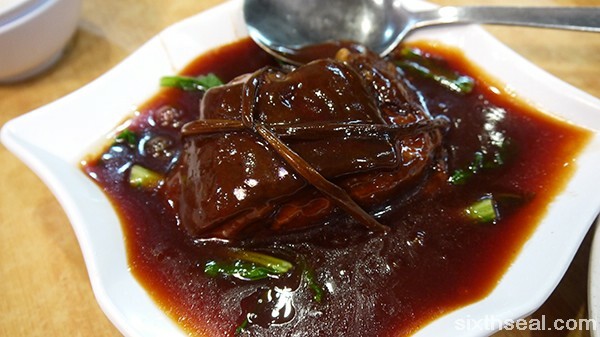 Su Dongpo who perfected the recipe. It’s usually very good but the execution was a little off this time since the ratio of fat to lean meat was really low despite being from the belly of the pig. I had to chew very hard to swallow the tough bottom meat. My dad enjoyed the meal immensely though and so did I. We usually just order 3 dishes for the two of us but I thought we should order 4 since it’s a special occasion. The waitress warned us against the large portions but I managed to polish off everything after my dad was full. The unusual decimal prices is due to the recent implementation of 6% GST and the bill came up to RM 90.95 although I only paid RM 90 coz the owner gave me a discount. Me: Dad, you’re not smiling in the photo. Dad: What do you mean? I am! I know, the title sounds a little unwieldy but it’s actually very accurate. 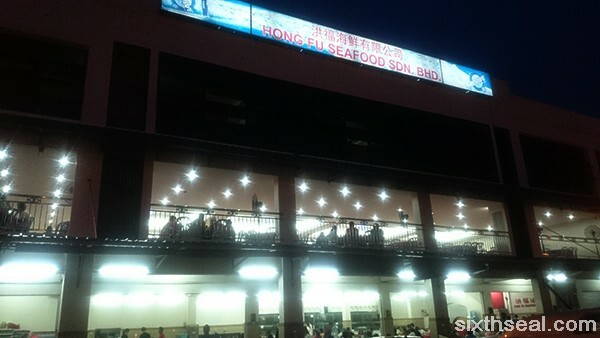 We had dinner at Hong Fu Seafood Restaurant last night. There were 12 of us and we took the largest table available and could barely fit everyone in. This dinner is supposed to be a “meet the parents” kind of thing for my cousin’s fiancé (and his mom) before their wedding at the end of the year. It morphed into a “meet the extended family” coz that’s just how we roll. Two of the uncles I’m closest with were there, as well as my dad, my grandma and several of my cousins and aunties to round things up. 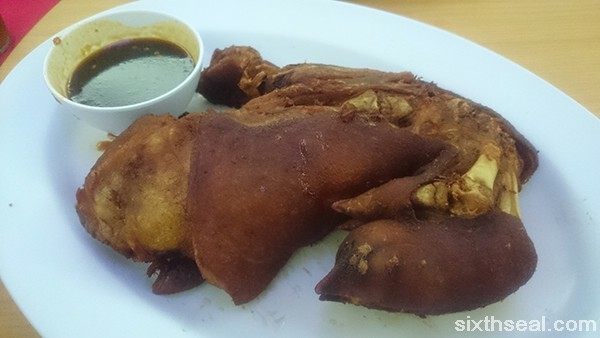 I’ve always found it amusing that people from Sibu refer to this iconic Filipino dish as “Philippines pork leg” when so many other places have a similar implementation e.g. Germany. The proper term for this dish is crispy pata. 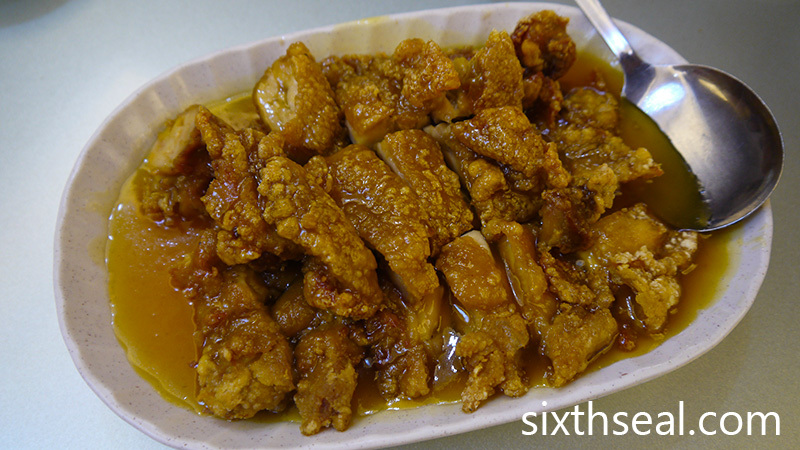 It’s deep fried pork leg (with trotters) that’s been simmered in water along with spices beforehand. 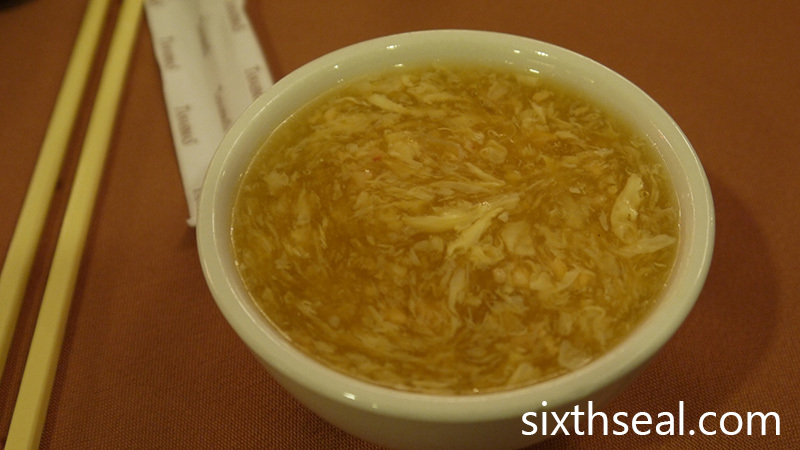 There’s usually a dipping sauce made with some combination of acidic, sweet and sour elements e.g. vinegar, sugar, soy sauce. 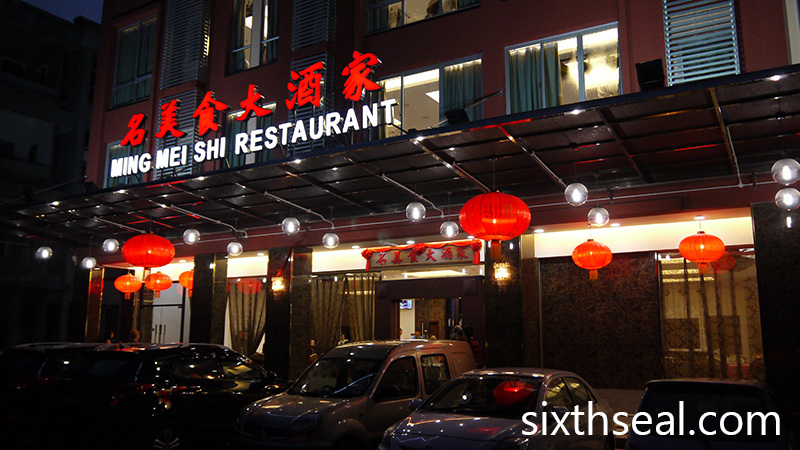 Hong Fu makes one of the best implementations of this in Sibu. It came in two huge platters to accommodate our late party. 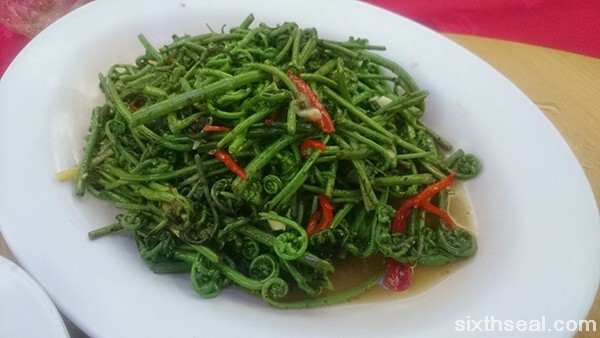 This is a Sibu classic, fiddlehead ferns called midin that’s cooked with a bit of chilli. I quite like it, it’s one of my favorite dishes. 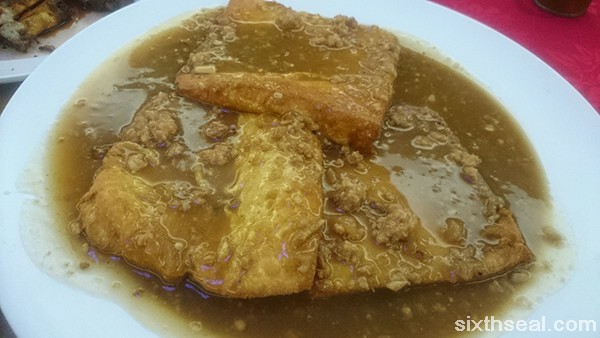 The large slabs (about the size of a CD case) of tofu is made in-house and lightly fried before a thick pork mince gravy is poured over it. I have been eating more tofu lately (get your mind out of the gutter) and I’m starting to enjoy it. This the obligatory green dish. I’ve also been eating more vegetables lately and I’ve been developing a fondness for it too, thanks to my better half. I did not grow up eating veggies – in fact I hardly ever ate vegetables until I was in my late 20’s. This is really yummy. I like sweet & sour pork and this tastes a little like that, but better! Everyone does this slightly differently, and it’s been bastardized in so many Chinese restaurants abroad. 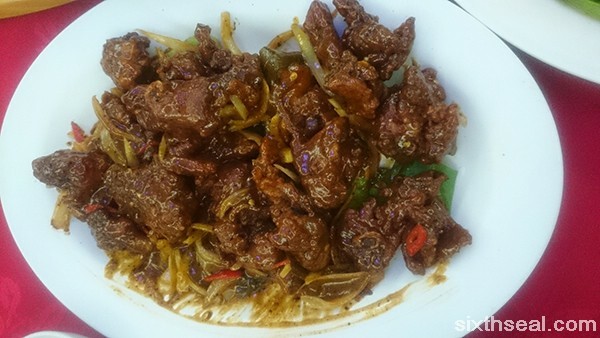 The chicken is fried so there’s a bit of crunch and the sauce is sweet, sour and spicy. 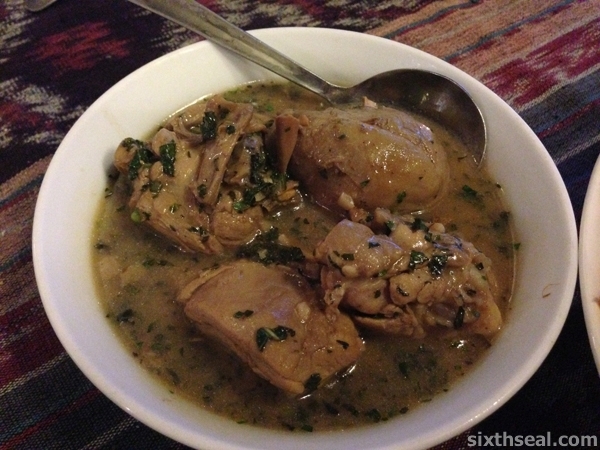 Lovely stuff – I can just eat this dish alone with rice. 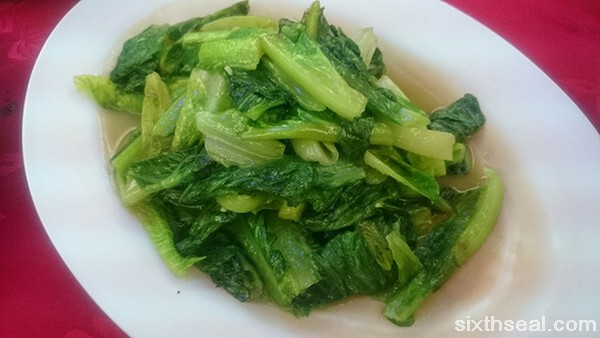 I don’t know why restaurants in Sibu always pair sea cucumber with broccoli but I ain’t complaining about Hong Fu’s implementation. 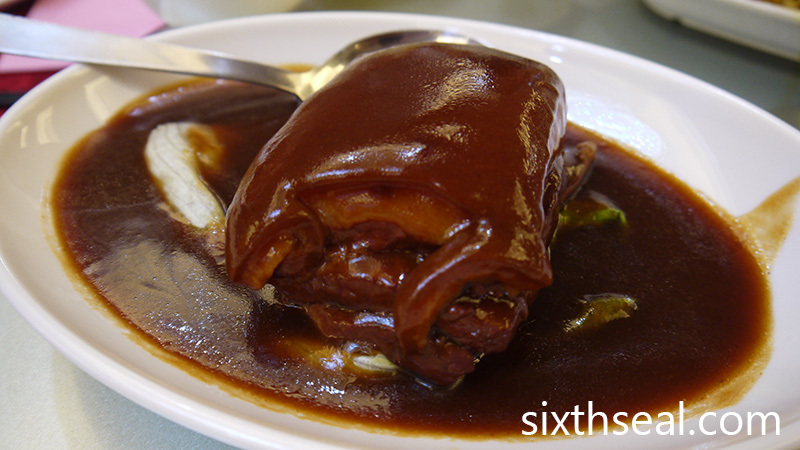 The sea cucumber is wonderfully tender and flavorful from the sauce. There’s just something very visceral about slurping the slippery things into your gob. My uncle brought this fish to the restaurant. You can actually do that here if you have a better or fresher specimen that you want to eat. You’ll be charged for the cooking but not the fish – it’s a similar concept to a corkage charge for wine in BYOB restaurants. I actually came back to Sibu for several reasons – I needed to meet with my first client for Pulse Consulting, open up my company bank account, discuss a new project that’s in the pipeline (potential new client, yay), celebrate Father’s Day with my dad, and hang out with my bro Eddy whose mom just passed last week and I’m glad I managed to catch my cousin Yih Wen and her fiancé too. “Don’t you want to go to some other place?” I asked my better half. She’s been eating at the exact same two places last time she was here – Aloha Cafe for lunch and Payung Cafe for dinner, so I suggested Baba & Siam but she really liked the durian ice cream we had last time at Payung Cafe so we ended up here for dinner, three days after we had another huge dinner with my sister and her family (who also loves Payung). This is our starter. Payung Cafe has a range of salads and most of them are great. I especially recommend the Herbs Salad (RM 8) but since it was a hot day, we went for the Guava Salad. 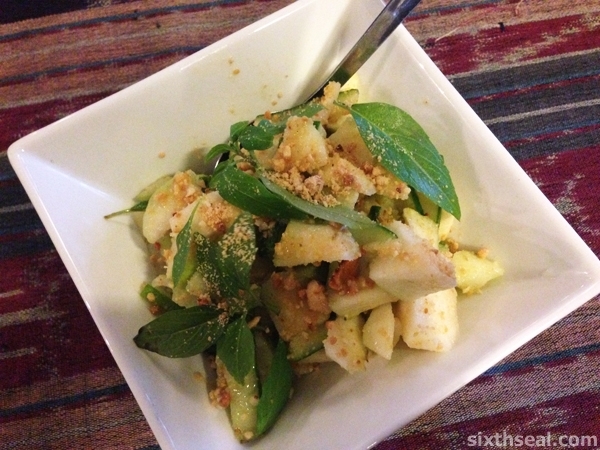 It’s a lovely dish of guava with calamansi lime, crushed nuts and other herbs. It’s extremely refreshing! This is a dish that has gone through many, many recipe tweaks since it was first introduced 8 years ago. 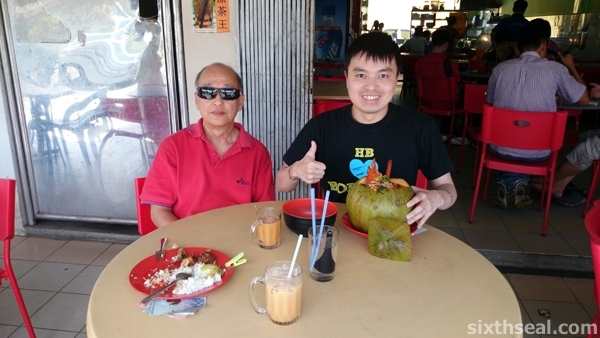 I was among the first people in Sibu who first came when Payung Cafe opened in 2008 and spread the word that it was a great al fresco dining place offering the best of South East Asian (and a couple of Western) dishes. 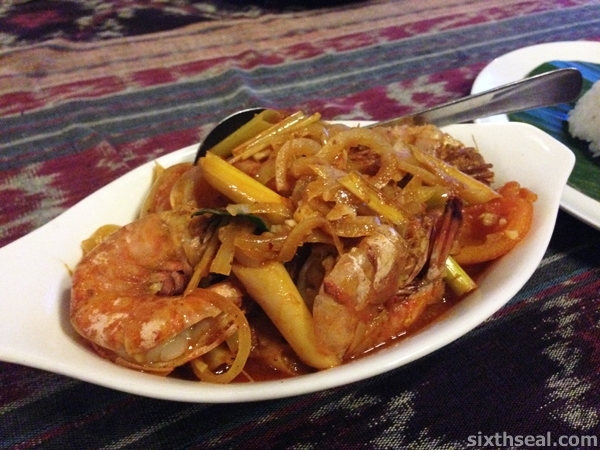 I love this stuff – it’s starfruit (carambola) cooked with large prawns. There are three inside and the rest is cut up starfruits and other vegetables. It makes for a good combination. My dad ordered this one. My better half’s order – she didn’t even have to think twice. Thai green curry is usually very spicy (at least if you eat the original from Thailand) but this is a much more muted interpretation meant for sensitive local palates. 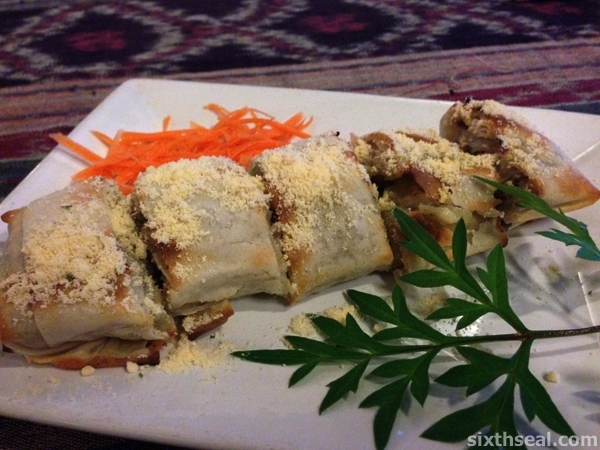 This is a Payung Cafe staple that we all ordered to share. 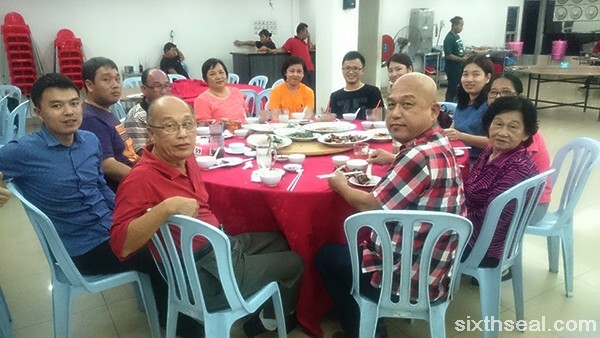 It’s homemade and all of their dishes comes with rice (RM 2) and we also wanted to have otak otak so the owners were kind enough to deduct RM 1 from our fourth dish – we ordered four in total for a party of 3 so we didn’t need the extra. It’s usually RM 13. This is one of their daily specials. 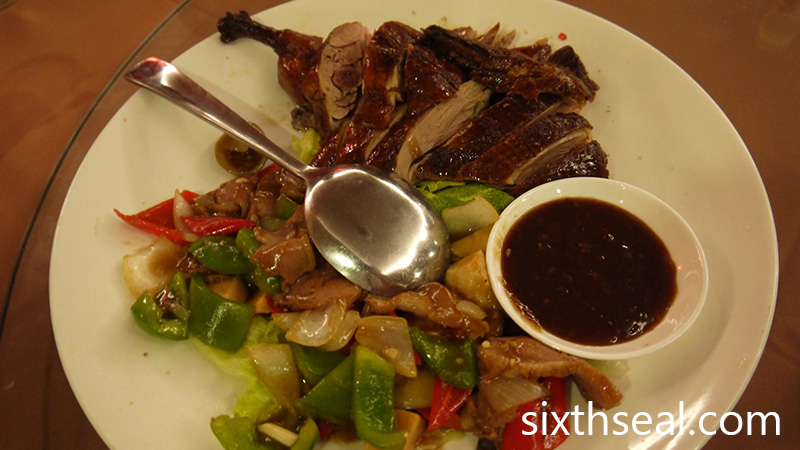 I’ve had the duck version and I like how they use Cambodian spices and herbs to make this dish – it’s quite nice. 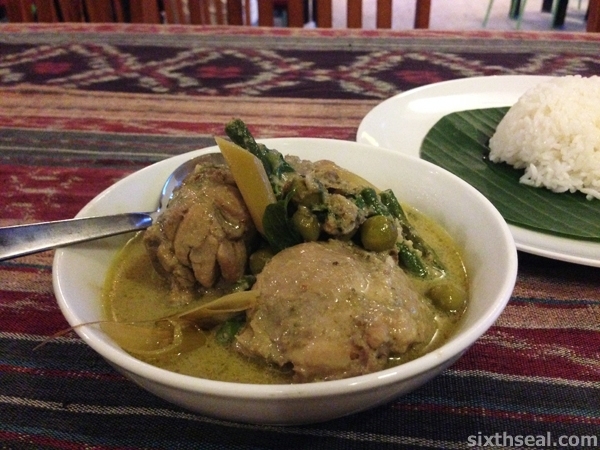 Payung Cafe also uses chicken legs only in their dishes so you’ll get cuts of drums and thighs. 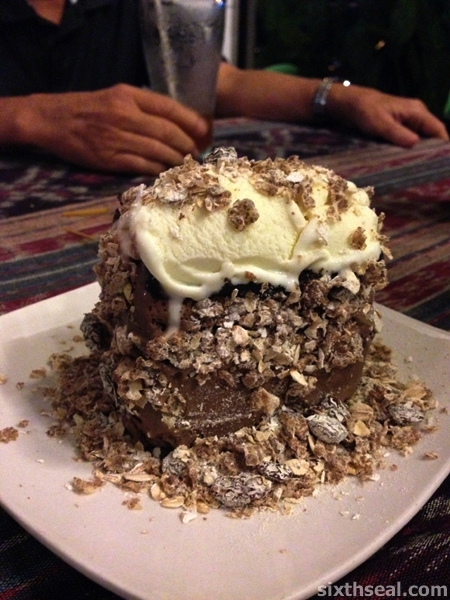 We ordered one dessert for each person – this is mine, the ever-changing Mulu Ice Cream. This too has gone through several revisions, it used to be round, then a square slice, then a rectangular slice. It’s not cake – this is a sandwich of two chocolate ice cream layers with muesli in between, which is then topped with vanilla ice cream. I really like this coz of the textural aspects, there’s muesli sprinkled on top too. 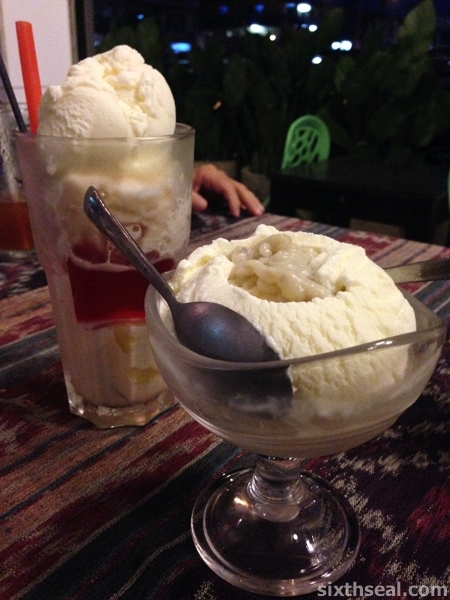 This is a delicious concoction of homemade vanilla ice cream with durian paste. It’s delicious when they’ve just made it and it tastes like real durians instead of dodol (a local confection made with durians). It’s the reason my better half loves this place. 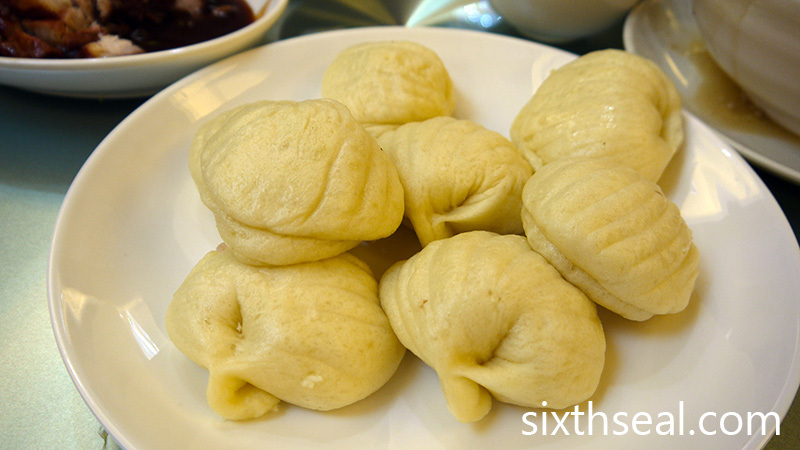 This is a classic Sibu dessert – it used to be served with shaved ice and bananas and Jello. Nowadays, it’s almost extinct. 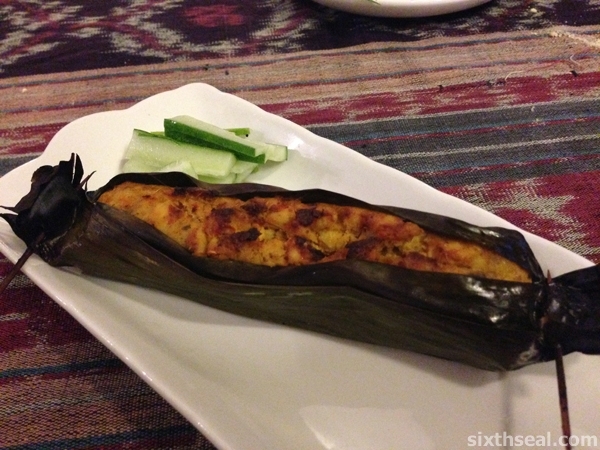 To the best of my knowledge, there’s only two places who still serves this – Peppers Cafe @ Tanahmas Hotel and here. This is the higher end version with homemade ice cream. 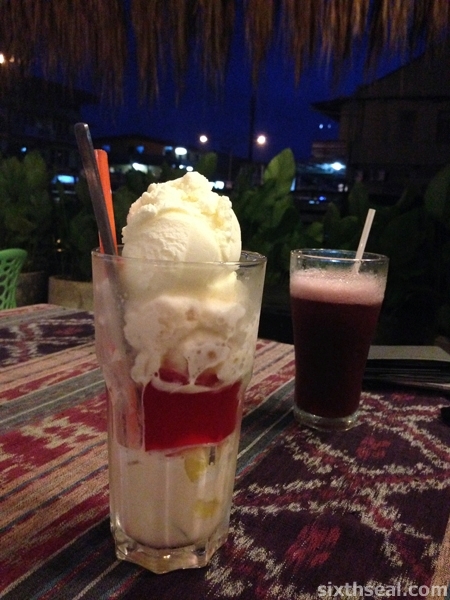 It’s pictured next to Roselle Juice (RM 6) – a refreshing drink made from the roselle plant. It’s misspelled as Roxelle Juice in the menu. 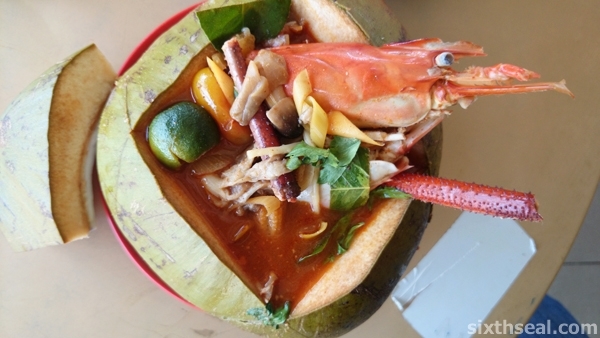 I’ve heard people telling me about this after I posted about the RM 33 big prawn noodles in a coconut available at Glory Cafe in Sarikei. Rowena and Alex both told me that Sibu itself has a version of this which they copied from Glory Cafe so I went to check it out with my dad yesterday. 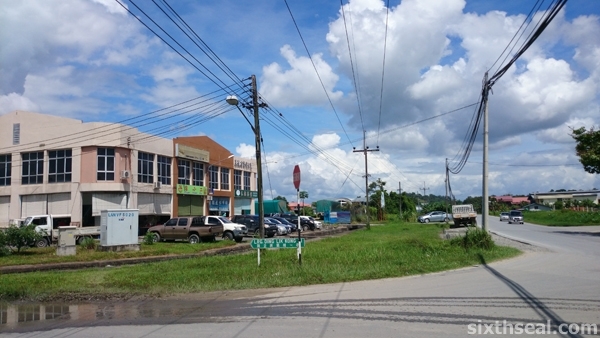 It’s located far inside the Ding Lik Kong industrial area near Igan River, which is about a 20 minute drive from Sibu town. It’s actually quite easy to find, I just forgot about the place. 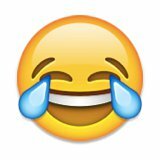 My dad called my uncle and got us oriented and it was just a matter of following road signs after that. 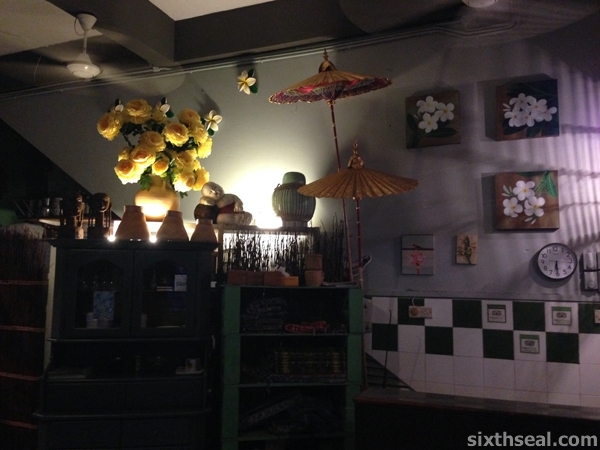 The name of the coffee shop is Dian Xiao Er and it’s located along a block of shophouses that has three (!!!) 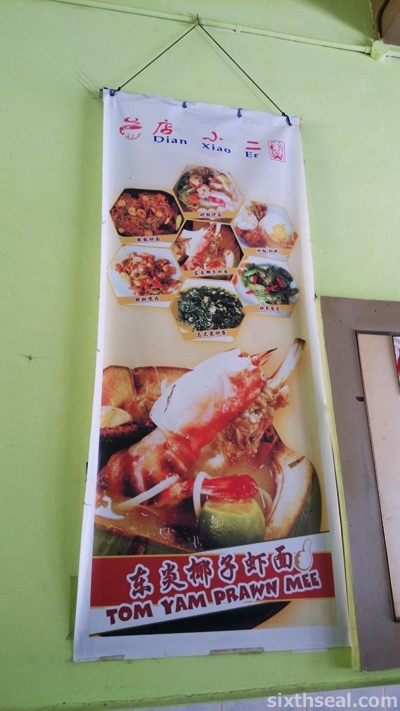 coffee shops – it’s the middle one and they have a large banner promoting their Coconut Tom Yam Big Head Prawn Noodles. The guy taking our order was a very friendly and chatty young kid who seemed to take a liking to me. 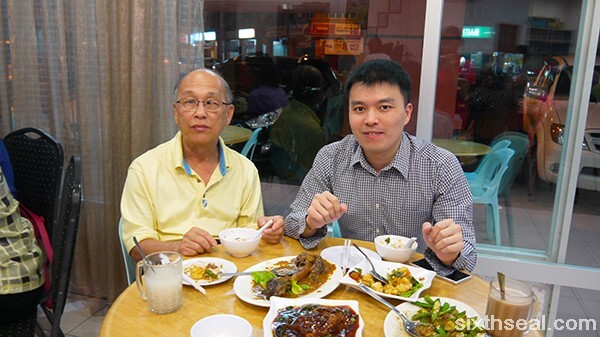 He told me that there’s at least 5 different places in Sibu that offers the same thing now – all duplicates of the original recipe from Glory Cafe. He also confided that he’ll be shifting work places at the end of the month and he personally did not think this was as good as the Sarikei version. 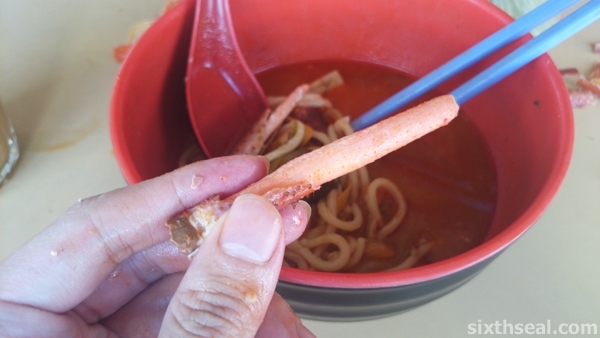 I was pleased to see that the big head prawn (大头虾) is indeed quite large with claws intact. 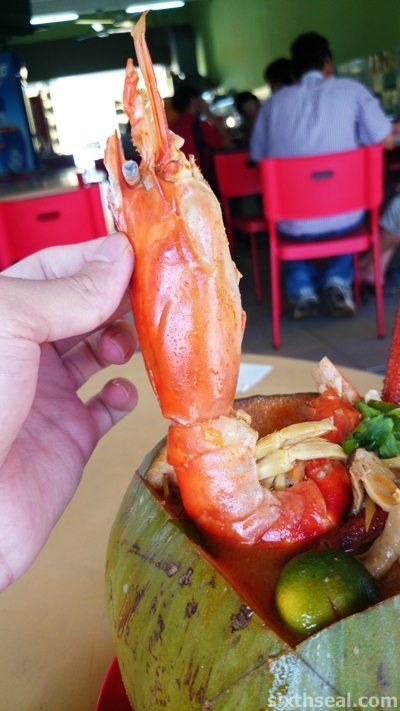 The big head prawn (Macrobrachium rosenbergii) is favored by Sarawakians due to the more intensely flavored meat. The other common type of prawn here is the big white prawn (Litopenaeus vannamei) which is milder. You can see the difference – the former really has a huge head in relation to the size of its body. If it were an inanimate object, I’ll compare it to a bobblehead or a chibi anime character. The claws are very important too as the meat from them is equivalent to a *2B pencil*! 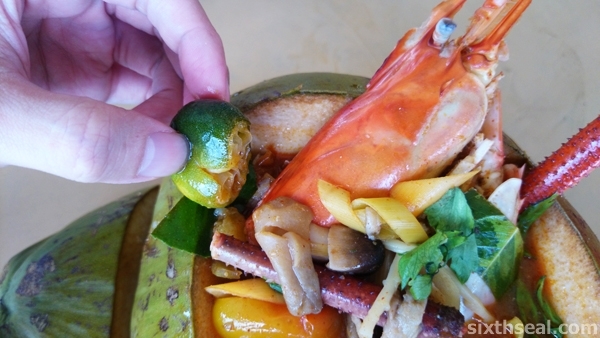 The uncooked calamasi lime is the obvious one as Glory Cafe in Sarikei has a very mushy lime that’s almost *disintegrating* compared to this relatively fresh specimen and that adds a lot to the tom yam flavor profile. Nevertheless, I enjoyed my meal and it turns out to be cheaper than driving down to Sarikei for their RM 33 Tom Yam Coconut Big Prawn Noodles. 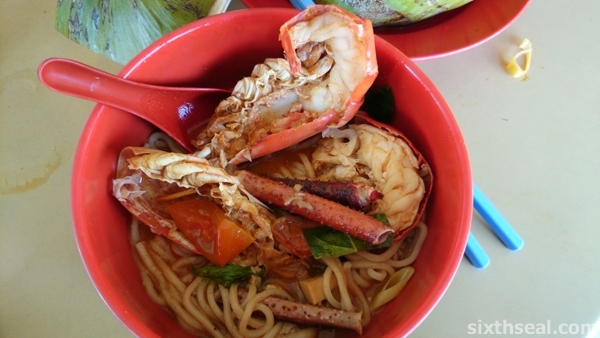 It’s also better than the notorious RM 35 big head prawn noodles in Min Kwong. 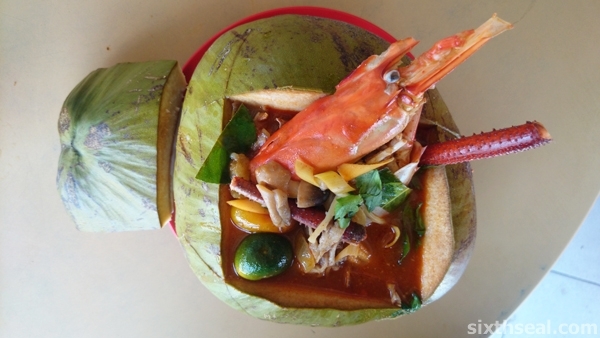 There are some problems with the recipe and it’s not exactly similar to the original one in Sarikei – anyone would be able to tell from a blind test taste. 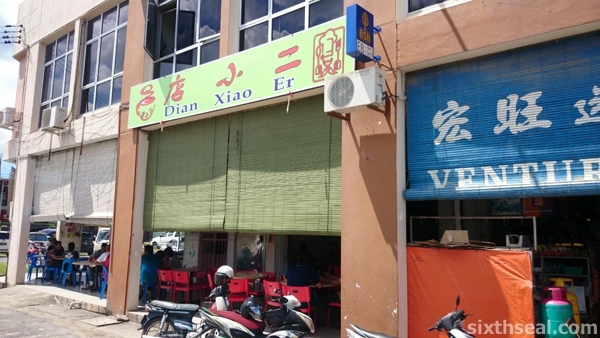 However, the one in Dian Xiao Er is a reasonably good facsimile of the original Glory Cafe Tom Yam Coconut Big Head Prawn Noodles and I’ll recommend it if you don’t feel like driving down to Sarikei – you can have your fix right in Sibu! 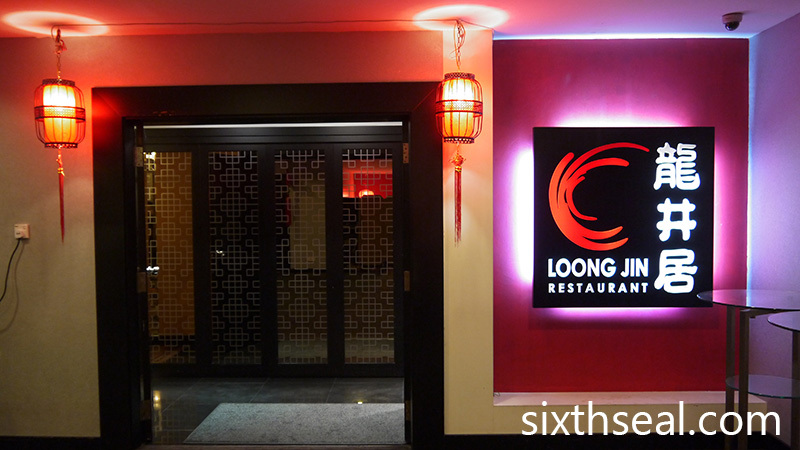 It’s located at Lorong Ding Lik Kong 31.